Lightly toast sourdough bread slices. 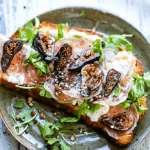 Spread each piece of toast with whipped ricotta and layer arugula, salami, and sliced figs evenly on top. Drizzle each piece with a teaspoon of honey (or more to your liking) and season with freshly ground black pepper. Serve immediately, open-faced. In a small bowl, whisk the ricotta together with lemon juice and olive oil. Season with sea salt and serve.